Home » News » PLANTWORX 80% sold out! It’s been an incredibly busy month in the PLANTWORX construction exhibition camp and the team can confirm that to date there are 166 confirmed exhibitors and the show is now 80% sold a sure sign that construction industry professionals remain optimistic and are confident that the construction event will be a success. Since the last update in November more than 20 new exhibitors have signed up and committed to exhibit at the inaugural show (14 – 16 May, Stoneleigh Park, Warwickshire, UK) these include AJC Trailers, Cabcare Products, C & G Engineering, ECY Haulmark, Marubeni Komatsu, MST, Oswald Record, who have reserved two stands and Topcon GB. These companies join a long list of other leading brands including Ammann, Avant Techno, Case, Finning Caterpillar, Hyundai, Hydrema, JCB, New Holland, Northerntrack, Prolec, Takeuchi, Terex, Thwaites, Ulrich Attachments, Volvo and Wacker Neuson, who will be exhibiting and demonstrating in the Dig Zone of the show, which is now 86% sold with and only 2% of the digging demonstration areas remain. There are more major manufacturers in the No-Dig Zone, which is almost 54% sold and 20% of demo area remains. Confirmed exhibitors include Bomag, Ladybird Crane Hire, Kubota, Marubeni Komatsu, Merlo, Manitou and Promax Access to name but a few. The Site Clearance Zone is almost 50% sold out confirmed exhibitors include, Eco Baughans 2000, ECY Haulmark, European Attachments, Taylor Construction Plant and Worsley Plant (Dig-a-Crusher). Some exhibitors have been telling the PLANTWORX team what they will be doing at the show – here are just a few examples of what visitors can expect to see in the demonstration zones at the show. 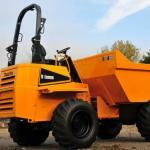 Thwaites is launching a new High-Power version of the company’s 9 tonne front tipping dumper. 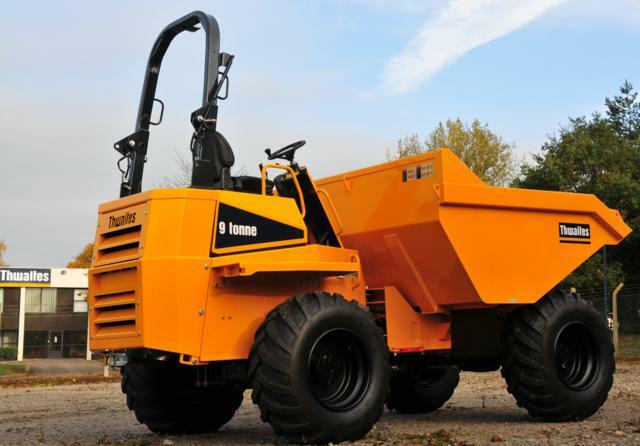 This new dumper is fitted with the Perkins 83 kW turbo after cooled engine and develops 111 bhp compared with the standard version which develops 94 bhp. 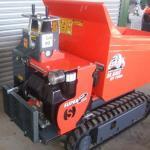 On a much smaller scale Slanetrac will be showing its HT1000 Tracked Dumper. Powered by a 19 H.P 2 cylinder Lombardini 25 LD 425-2 electric start engine or by a 14 H.P Honda GX 390 electric start engine this sturdy little track dumper has a load capacity of 1 ton. With a maximum width of 750mm and a length of 1900mm it can turn on its own length offering greater accessibility and manoeuvrability in urban areas or areas where larger plant can’t gain access. Merlo is still devising its plan for PLANTWORX but has confirmed that it will be showing its new Automatic Implement Recognition system – M CDC (Merlo Dynamic Load Control system). During 2013 this will be installed on all of Merlo’s telescopic handlers – both agricultural and construction. The company is also in the planning stages of organising a ‘driver’s challenge’ at the show. Also at the event will be the brand new Merlo P25.6 Supercompact telehandler which features a cab with overall height reduced by 150 mm to 1.77m – that’s only 5ft 10 inches! Merlo’s David Dean said, “Merlo has turned out a machine that has the widest cab in the sector (995mm inside width) as well as being the lowest. Comparisons elsewhere are interesting – most other machines in this sector (1800mm wide) have cabs anything up to 200 mm narrower and 230 mm higher. In these compact machines those are, relatively, huge differences. 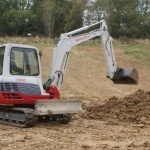 The show will be the first occasion at a UK exhibition to see and test drive the recently launched Takeuchi TB285 – 8.5 tonnes excavator, which according to Takeuchi, is a machine packed full of improved operating features – auxiliary hand and foot controls, eco modes, engine efficiency, angled dozer and more foot room . 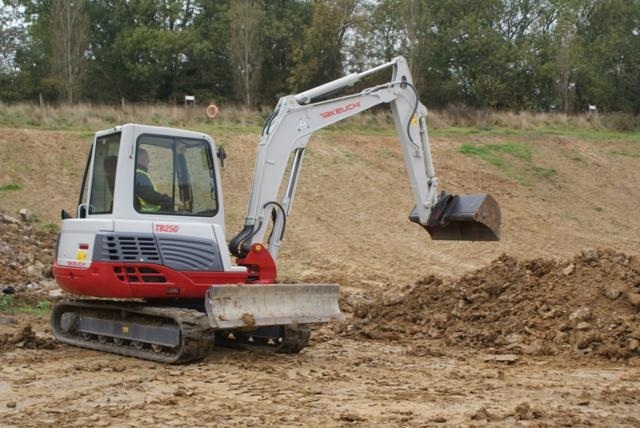 Operators will be invited to try out this machine and other Takeuchi models from the 14 strong stable at the show. Probst Handling Equipment is launching its brand new RVD-4 pipe lifting grab designed for the safe lifting of pipes from off transport vehicles and the placement within trenches. The grab can be attached to any lifting device with a quick change facility. It’s capable of lifting one pipe up to 4000kg – with diameter’s of between 300-1200mm. A minimum weight of 600kg is needed for lifting a pipe. Ulrich Attachments will be showcasing a number of their products including the popular Hy Tip buckets, compost forks, hydraulic raised steps and a brand new excavator tree cutter. Publicly shown for the first time at the show, the Ulrich tree cutter will be available in two models – the TC200 and the TC250. With pin or quickhitch mounting the cutter has three finger positive clamping for added control when picking up and moving trees up to 250mm in diameter and will fit on a wide range of excavators.